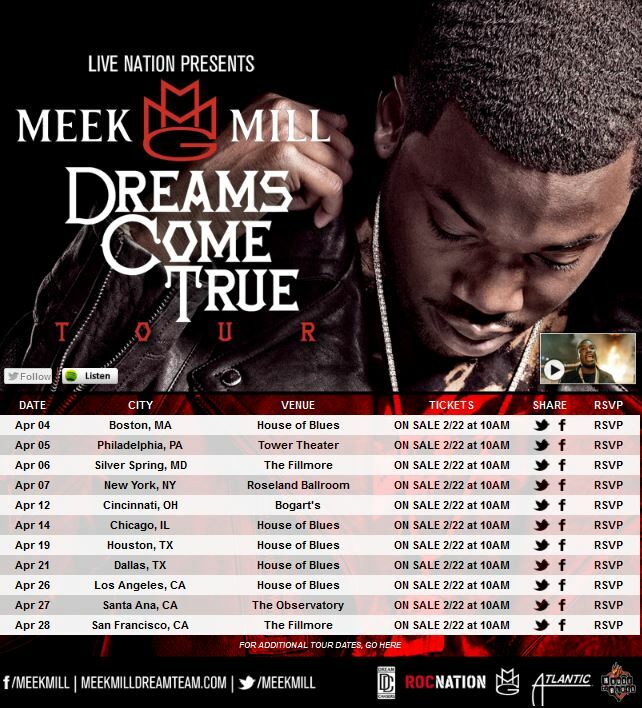 Meek Mill will be heading out on his "Dreams Come True" tour along with his Dreamchasers artists. Late last year, Meek Mill filed a request to a judge to loosen his travel restrictions which are in place due to gun and drug charges the rapper had in 2008. Unfortunately for the Philly spitter, the request was denied, but he is still heading out on a domestic tour. The Dreamchasers rapper has announced the dates for his upcoming Dreams Come True tour which is presented by Live Nation and will feature artists on Meek’s Dreamchasers imprint as well. Getting underway on April 4th at the House Of Blues in Boston, tickets go on pre sale February 19th with the full public sale kicking off on February 22nd. The 11 city tour ends on April 28th at The Filmore in San Francisco. Check out the full dates and venues below.